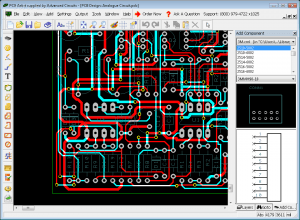 PCB Artist 1.3.1 is a CAD Software product from 4pcb.com, get 5 Stars SoftSea Rating, PCB Artist is a user friendly, fully integrated Schematic Capture & Free PCB Layout Software that you will find easy-to-use. You can download PCB Artist and install the product at no charge and start designing you PCB design almost immediately. Once complete, your files are saved to your computer, or you can upload and send to us for order placement. There are tutorials to get started and Gerber files are available with your order. PCB Artist runs under the Windows operating systems but Windows XP or Vista is recommended. 44. Properties Status Bar The license of this design software is Freeware, you can free download and free use this Design software.